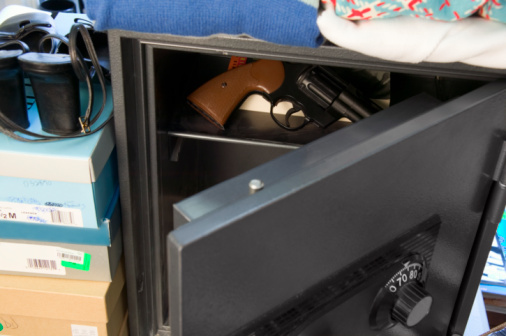 A Liberty safe provides solid protection for your valuables. Liberty goes to great lengths to ensure their safes are durable and reliable. Unfortunately, even the sharpest of people may forget how to open their safe when they need to get into it. It's easy to learn the how to open manual, motorized electronic, and direct drive electronic locks. Make sure the arrow on the outer rim of the dial is aligned with the top of the dial. Turn the dial left at least four times before stopping on the first number of your combination. Turn the dial right, passing the second number of your combination twice and stopping on it the third time. Turn the dial left, passing the third number of your combination once and stopping on it the second time. Turn the dial right until the dial stops, usually around 87 on the dial, and open your safe. Center the handle between the left and right stop points. Failure to do so can prevent the lock from opening. Enter the six digit combination to your lock, followed by the pound sign. After pressing each number the lock will electronically chirp and the red LED on the keypad will momentarily light up. Listen for the sound of the lock retracting. After hearing the lock retract you have six seconds to open the door. If you don't open it within six seconds the lock will reengage and you will have to start over. When you hear the lock retract, turn the handle and open your safe. Center the handle between the stop points to make sure the lock will open. Turn the keypad counterclockwise until it stops. Enter your six digit combination, followed by the pound key. Turn the keypad clockwise until it stops within six seconds and open your safe.